I finally found a recipe titled Hershey’s “Perfectly Chocolate” Chocolate Cake, hmm, “…Perfectly Chocolate”, sounds about right to me! The first time I made it, I used Hershey’s unsweeted cocoa (as the recipe calls for). They turned out pretty good. 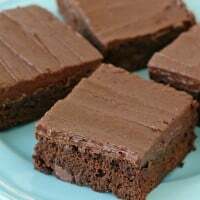 The next time I made them, I used Ghirardelli brand unsweetened cocoa, and… perfect! The Ghirardelli brand gave a much deeper chocolate flavor. So I’d highly recomend using either Ghirardelli brand unsweetened cocoa, or the best quality brand you can find. You can really taste the difference. Since discovering this recipe, I’ve made it dozens and dozens of times. And every time, it’s delicious! 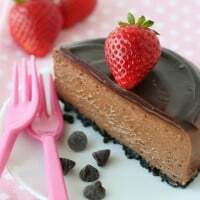 The cake has a nice light and fluffy texture and a rich chocolate flavor. Line muffin tin with paper liners. Heat oven to 350*F.
In a large mixing bowl, stir together sugar, flour, cocoa, baking powder, baking soda and salt. Add eggs, milk, oil and vanilla. Beat on medium speed for one minute. Stir in boiling water (the batter will be thin, don’t worry, this is right). 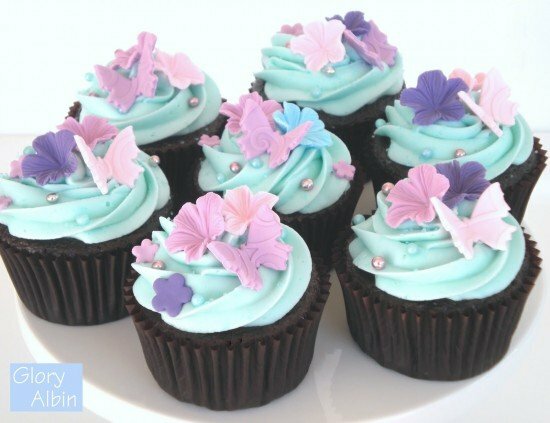 Bake cupcakes for aproximately 18-22 minutes. Cool completely on wire rack before frosting. Try the recipe HERE for either vanilla or chocolate (my favorite!) cream cheese frosting. FYI your ad placement needs some help. My 11 y/o daughter made these, but because an ad is between the sugar and flour, the sugar was completely missed and left out, which made for salty cupcakes. Bleh! Trying again WITH the sugar!! Could I substitute almond milk for the whole milk as my family is all somewhat lactose intolerant?! I have never made it with an milk substitutes. It’s certainly worth experimenting, but I’m not 100% sure what the results will be. I use almond milk all the time. Works great! Are the moist or kind of dry? If I prefer more moist what can I add more of? This recipe produces a nice moist cupcake. You do not need to make any adjustments. Happy baking! 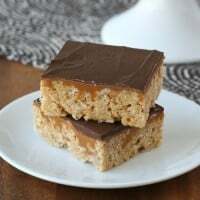 This recipe is always amazing, I have made this a few times already!! Thank you! Question about adding zucchini, have you ever done this ? I am unsure if I can somehow add in grated zucchini or simply replace an ingredient with grated zucchini. Any suggestions are greatly appreciated!! Have you made this recipe into a cake? If so please share how you did it!! Can i substitute/add instant coffee to that 1cup boiling water? Just to make the chocolate flavor stronger. I’ve done this and it works well. I just brew a fresh cup of coffee and replace it for the water. I used the Hershey’s Special Dark cocoa powder too. I make all the time your chocolate cupcape recipe and add some cinamon and a dash of clove. I top them with your cream cheese icing. 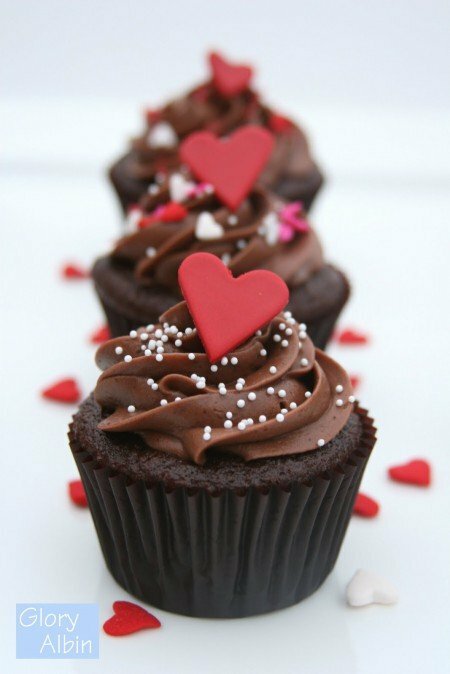 Every one love my cup cake and keep asking me for those. Thank you! Excellent recipe! Can one use caster sugar in this recipe? Finally a chocolate cupcake recipe that doesn’t look labor intensive (for weeknight baking to bring to work the next day)! I want to make “bloody brain” cupcakes for Halloween with this recipe. Is the cake sturdy enough to be filled with berry jam? Can’t wait to try this! Can I substitute milk for half and half? Yes, that will work just fine, but avoid fat free milk if possible. Hi – will this recipe still turn out without the eggs? I am baking for a class and a student has an allergy to eggs. Laura…you can use the following as an egg substitute: 1-1/2 tablespoons vegetable oil mixed with 1-1/2 tablespoons water and 1 teaspoon baking powder per egg. Do you use the paddle or whisk attachment? Just I need case someone wants to modify this recipe using Carob powder and unsweetened almond milk…it doesn’t work! Had to throw them away. Hi. Our local shops don’t have baking soda but only have baking powder. Suggestions? Can i cut the ingredients in half if I need less cupcakes? Same here. I only need like 12 cupcakes when I bake. This tastes sooo good though. Graduated sugar or powders sugar ..? I’ve just made this recipe – it is delicious, but mine didn’t have the nice flat tops! Some made points and others rises to the sides. Although I’ve carefully filled my liners with the same amount of batter, not 2 of them look the same. Hi! Can I use fresh milk instead of whole milk? Fresh milk as in raw milk? I don’t see any issue with that. I’ve only made it with standard, commercially processed milk, but I think most any would work as long as most of the cream has been skimmed off. Is both the cupcake recipe and frosting recipe peanut free? There are no peanuts listed for either the cake or frosting. I am not sure what happened but… I followed your instruction, point by point and each time I test the cupcake it is still …. liquid? Hi Heather, I can’t quite imagine what the issue might be without being with you in the kitchen. I can only assume that an ingredient is missing, or you simply need to bake the cupcakes a bit longer. I have made this exact recipe hundreds of times, so I am quite confident that it can be made successfully. I hope you give it another try. Followed the instructions and while baking the cupcakes sunk rather than rising. Please help. Let me just say. This became part of my mother’s recipe book since the moment we made it. I would say, after trying them all, this one is by far the best. Chocolate. Cupcake/cake. Recipe. Ever. Period. Its so perfect, moist, but at the same time airy, spongey, it caramelizes on top. Completely gorgeous, it melts in your mouth. Its like those perfect boxed cakes but sets the bar even higher. This should be a secret recipe kept in the family for the next generations because everyone goes completely crazy once they try it. We make different chocolate cakes and my dad and brother always say “but i want you to make the one (I) found… that one is the best one”. So yeah. Thank you so much for sharing! I’m a little perplexed by your question. This is a recipe… you can see the full list of ingredients. There are no peanuts in the recipe, but it’s up to you to choose cocoa powder or other ingredients that are made in a peanut-free environment if that’s what you need. Happy baking! Hi! 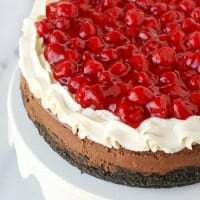 Thank you for sharing your amazing recipes. Can I use buttermilk instead of whole milk? Would it change the flavor? My favorite piping tip for piping icing on cupcakes is a Wilton 1M, it’s an open star tip. It’s by far the one I used the most! Happy baking! Yes, 2% would be fine, but I would not recommend non-fat or 1%. If I have a lower fat milk on hand, then I’ll just add a bit of heavy cream to fatten it up a bit. 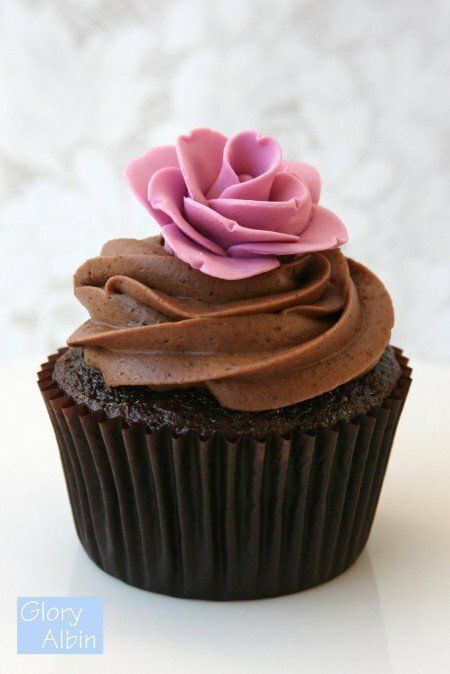 Can I use cake flour instead of All Purpose flour for these chocolate cupcakes? If I do, would that change anything else in the recipe? ?